In episode 6 of drama, 'I Summon You, Gold! (금 나와라, 뚝딱! 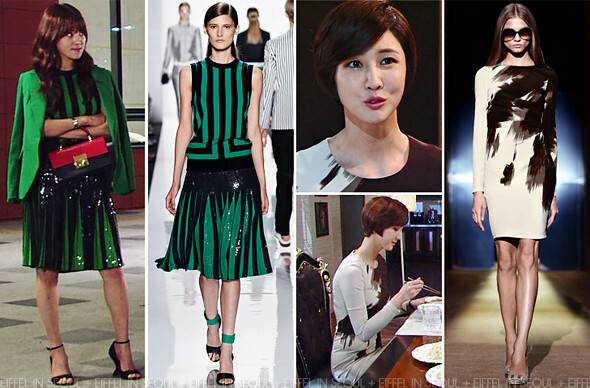 )', Han Ji Hye (한지혜) wore a striped green ensemble from Michael Kors Fall/Winter 2013 collection. Her beautiful look was accessorized with a 'Middleton East West' bag and a pair of gorgeous Jean-Michel Cazabat 'Ilaria' sculptured wedge. The green blazer may be a little too much but I love her choice of bag and shoes. Later in the episode, Lee Soo Kyung (이수경) wore a long-sleeved printed dress from Gucci Pre Fall 2010 collection. It was a lovely surprise to see an actress wear a dress from few seasons back.